The gross and net distributable surplus of nitrogen in agriculture decreased in the period 1992–2015. Trend analysis for this period shows that gross distributable surplus nitrogen decreased by 46% and net surplus by 78%. Smaller surpluses indicate better management of nitrogen and, consequently, reduced emissions of nitrogen compounds in the environment. 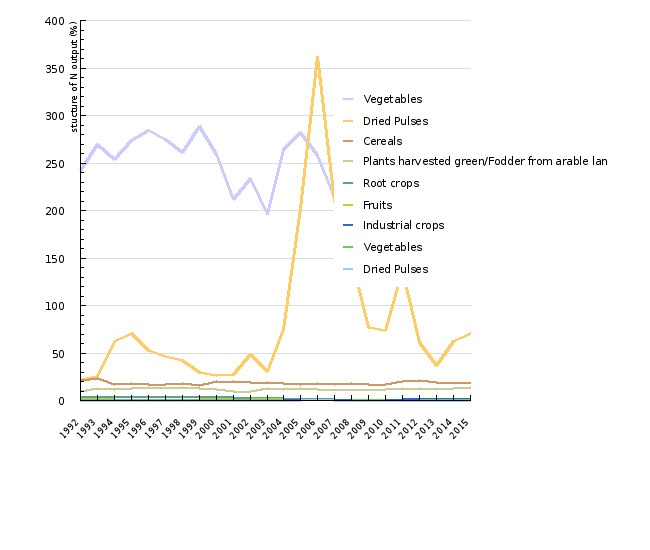 On average, 52% of nitrogen input was taken up by crops in the period 1992–2003. 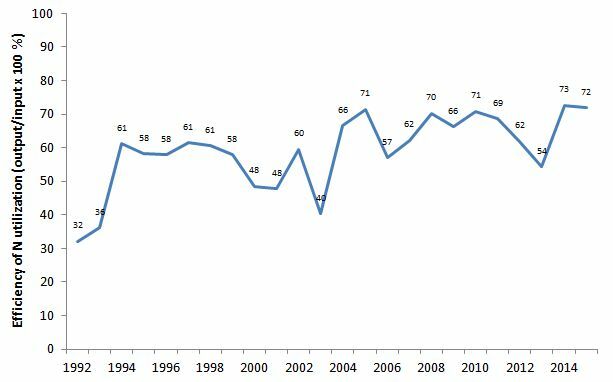 This proportion increased to 66% in the period 2004–2015 and even exceeded 70% in individual years. In the period 2005-2014, Slovenia recorded the same average gross distributable surplus nitrogen as the other EU Member States (53 kg N/ha). According to OECD-EUROSTAT methodology (2013), the balance (surplus) of nitrogen (N) in agriculture is defined as the difference between nitrogen inputs to and outputs from agricultural land through crops. We distinguish between gross and net balance. Gross balance is the difference between total input and output of nitrogen. Total (gross) input of nitrogen is represented by the following sources: total nitrogen excreted by farm animals, nitrogen in mineral fertilisers, biological fixation of nitrogen by legumes, deposition of atmospheric nitrogen, nitrogen from other organic fertilisers (compost, sludge from wastewater treatment plants, etc.). Net balance usually refers to nitrogen required for the growth of crops (net input). Net input is calculated by subtracting nitrogen that is released into the atmosphere (from animal sheds, manure storage tanks, during grazing, during and as a result of fertilising with mineral, animal and other organic fertilisers, during the decomposition of crop residues in soil and as a result of cultivation of histosols) from the total (gross) input. This is nitrogen that is released into the atmosphere through emissions of ammonia (NH3) nitrous oxide N2O) and nitrogen oxides (NOx). Gross nitrogen surplus represents a threat to the environment, as nitrogen may be released into the water or end up in the atmosphere in various forms of reactive nitrogen. In particular, gross nitrogen surplus represents a threat to waters. It should be pointed out that another potential threat stems from the fact that neither nitrogen in its molecular form (N2) nor the potential build-up of nitrogen reserves in soil are taken into account in the assessment of nitrogen balance surplus. Gross and net nitrogen balance is expressed in tonnes of nitrogen at the national level and in kilograms of nitrogen per hectare of utilised agricultural land. 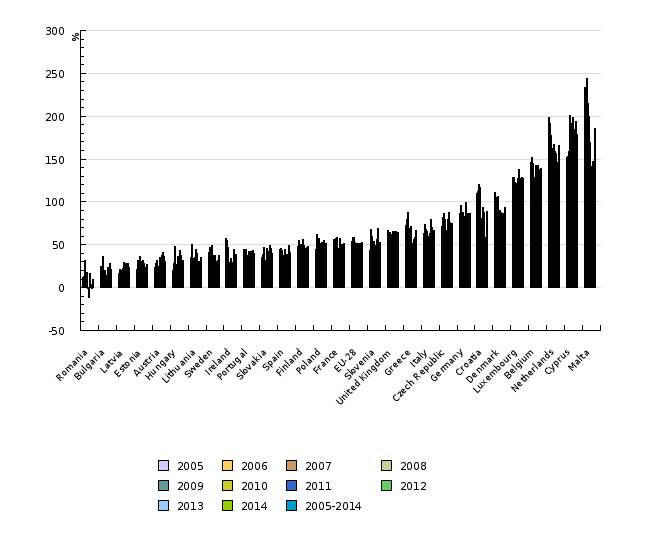 The data for the period 1992–2015 is presented. The indicator also shows inputs and outputs of nitrogen and presents a comparison with the EU-28 countries. Agricultural Institute of Slovenia, 2016. Agricultural Institute of Slovenia, 2016; EUROSTAT, 2016. Balanced consumption of nitrogen from mineral fertilisers and livestock manures, gradual increase of the extent of organic farming and prevention of soil loading from point and dispersed sources. To fertilise plants in a way that makes the best use of nutrients without those nutrients being emitted into groundwater and the atmosphere. To reduce and prevent further pollution of waters by nitrates from agricultural production. In the period 1992–2015, the total nitrogen input to agricultural land was reduced from 89,556 to 75,300 tonnes of nitrogen (16%). Input of nitrogen per hectare of utilised agricultural area was also reduced, from 161 kg N/ha to 158 kg N/ha (by 2%). The main sources of nitrogen are livestock manure and mineral fertilisers. 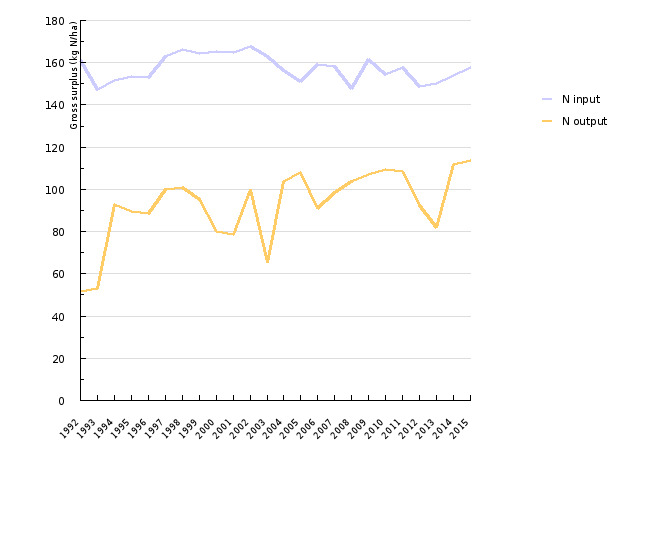 Their contribution to nitrogen input in 1992 and 2015 was 48% and 39%, respectively. Other sources are less important: atmospheric deposition contributes 10% to total nitrogen input, biological fixation by legumes contributes 2%, while seeds and seedlings contribute 0.4%. 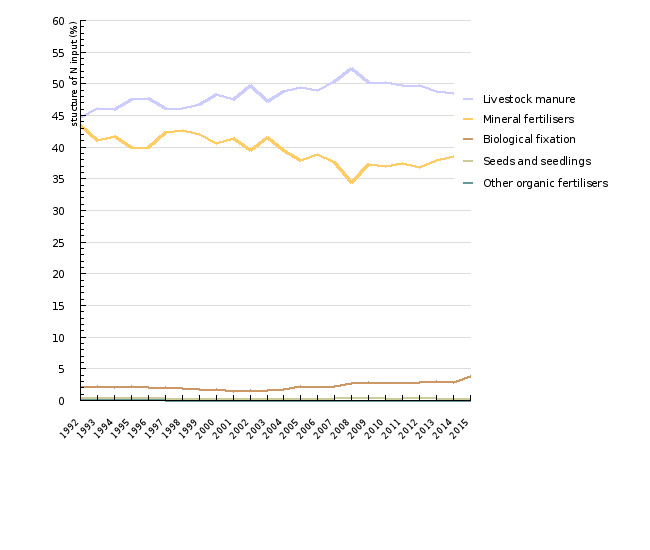 The main reason for the decrease in nitrogen input in the period 1992–2015 is a 27% reduction in the consumption of nitrogen from mineral fertilisers. Input of nitrogen from livestock manure was reduced by 8%. The reduction of utilised agricultural area resulted in reduced input of atmospheric nitrogen (by 14%) and input of nitrogen through seeds and seedlings (by 14%). In the period 1992–2015, input of nitrogen through biological fixation increased by 60% due to an increase in the cultivation of legumes. The balance of nitrogen, thus the difference between the input and the output of nitrogen, indicates a balance surplus of nitrogen. In the period 1992-2008, the balance surplus amounted to between 23 and 94 kg N/ha. We observed the greatest balance surplus (more than 80 kg N/ha) in the years 1992, 1993 and 2003. Until 2000, with the exception of years 1992 and 1993, the balance surplus was between 38 and 66 kg N/ha, and since 2004, it has been mainly decreasing. In 2008, it was only 24 kg N/ha. Nitrogen output through crops varied considerably in the period 1992–2015, amounting to between 32,000 and 62,000 tonnes of N per year. Output of nitrogen per hectare of utilised agricultural area in the mentioned period amounted to between 52 and 114 kg N/ha per year. Such great differences are a consequence of different weather conditions, as nitrogen output is notably lower in dry years when crops yields are lower. The main source of nitrogen output is permanent grassland (64%), followed by grain fields (19%) and green fodder from arable fields (12%). Other crops (root crops, tubers, fruit, vegetables, legumes and industrial plants) combined contribute 5% of nitrogen output. In the period 1992–2015, gross nitrogen balance amounted to 42–109 kg N/ha. The greatest surplus (more than 80 kg N/ha) was recorded in the dry years of 1992, 1993, 2000, 2001 and 2003, when crop yields were reduced, which resulted in lower nitrogen output. The trend analysis clearly revealed that gross nitrogen balance in the period 1995–2015 was decreasing (by 1.6 kg per year, 46% over the entire period). Net balance was also decreasing (by 1.6 kg per year, 78% over the entire period). Lower surpluses indicate better nitrogen management and, consequently, lower emissions of nitrogen compounds into the environment. While 52% of input nitrogen was taken from agricultural land in the period 1992–2003, the percentage increased to 66% in the period 2004–2015, even exceeding 70% in certain years. In the last five-year period (2011–2015), average gross nitrogen balance was 52 kg, while net balance was 19 kg. In 2000, Slovenia's gross nitrogen balance was equal to the average of the EU Member States (53 kg N/ha). Countries with distinctly high gross nitrogen balance include Malta (186 kg N/ha), Cyprus (179 kg N/ha) , the Netherlands (166 kg N/ha), Belgium (139 kg N/ha) and Luxembourg (127 kg N/ha). Estonia, Latvia, Bulgaria and Romania had the lowest gross nitrogen balance (10–27 kg N/ha).